Crete is much smaller than Sicily, but is the largest of all of Greece’s islands. The island is approximately 260 kilometers long and 60 kilometers wide, but is known for its varied terrain. Here you’ll find everything from white sandy beaches to mountains, gorges and rivers. The Azamara Quest tendered in the ancient Venetian port of Chania. Chania’s Old Town is very well preserved, and the mix of Greek, Venetian and Ottoman influences are fascinating. Even though it’s October, it was a very warm, sunny day – perfect for strolling the cobblestoned streets, shopping and enjoying patios. We stopped for lunch at a family-run restaurant near Old Harbour called Xani, and ordered a variety of Greek specialties – tzatziki, Greek salad with a substantial about of feta cheese, souvlaki and gyro. We walked the calories off by strolling down the waterfront and breakwater to see Chania’s iconic lighthouse up close. The lighthouse was originally built by Venetians in 1570, and was reconstructed in 1830. 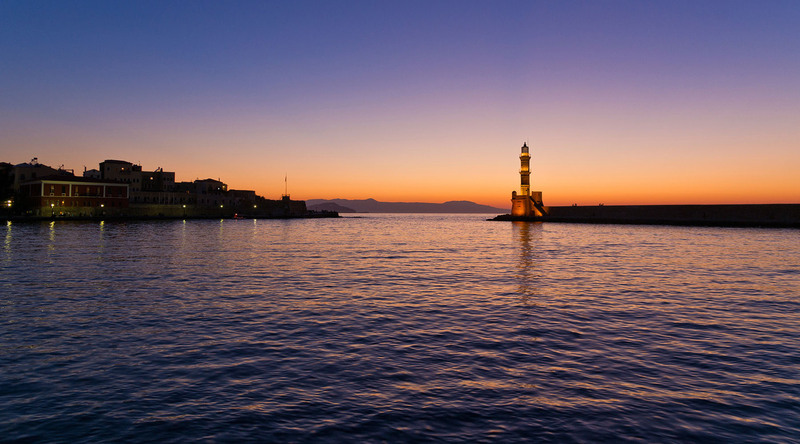 Chania is home to several museums, including a Greek National Football Museum, the Museum of Typography, the Archaeological Museum, and my Hide & Tweet location: The Maritime Museum of Crete. You'll find this museum along the Venetian waterfront, and admission is only three Euros. It's small, but well worth a few minutes of your time. Crete has a fascinating maritime history, and the museum was the perfect place to learn about it. The island has been occupied by the Romans, Saracens, Genoeses, Venetians and Turks, and was occupied by Nazi forces during WWII. Congratulations to Instagram user @lifeofmytime, who correctly identified my location! She’ll receive a Fujifilm Instant Camera. Perfect for capturing memories on your next cruise! Just before sunset, we returned to the Azamara Quest to enjoy the White Night onboard party. If you’ve never experienced one of these legendary parties, you simply must. What an event! The AzAmazing crew turned the pool deck into a restaurant, and guests enjoyed an incredible buffet dinner. Later, a group of musicians and dancers came onboard and treated everyone to a local folkloric performance. Many guests even learned to do a traditional Greek dance! Tomorrow, I’ll be Hiding and Tweeting from the beautiful island of Santorini! Will you find me? Cruise to Chania, Crete in June 2016 during the 10 Night Greek Isles & Adriatic Voyage.